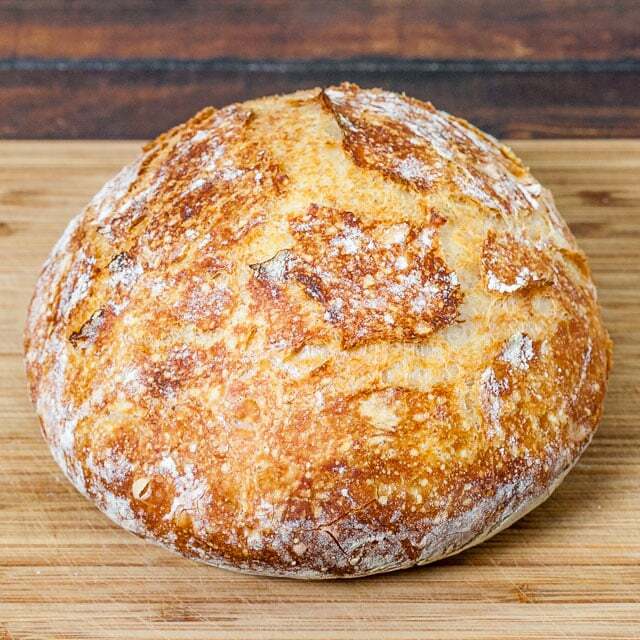 The simplicity of this no knead bread is what I love the most and the fact that your entire house will smell of fresh bread as you bake this. This bread could not get any easier, it’s even easier than the artisan bread. The ingredients are the same as for the artisan bread but the way it’s made, totally different. The thought of baking bread in a cast iron pot with the lid on never crossed my mind years ago, but it makes complete sense. As you bake it with the lid on, it creates steam inside the pot therefore creating a nice crust on the bread. We know steam makes crusty bread, I learned this a long time ago as well. 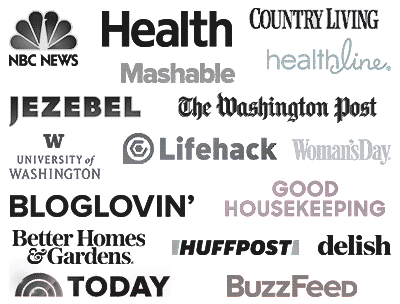 No Knead Bread was first published in the New York Times about 10 years ago. It’s a bread you make that, obviously, requires no kneading which is why it’s become so popular. You basically throw everything in a bowl, mix it up, let it sit around for a few hours and let the yeast do its work, then bake it. The slow rise is what gives the bread that great flavor, and the baking method is what gives it that incredible crispy crust. Making this could not get any easier. Simply mix the flour, salt and yeast together and then add the water to it. Mix it using a wooden spoon or spatula until it’s all incorporated, no need to over mix, it will look like a sticky mess. Cover up the bowl, let it rest outside on the counter for 12 to 18 hours. Yes, if you thought you were going to eat bread today you won’t, you have to let it rest for that long, and also please do not refrigerate it. I left mine for 18 hours overnight, and after all that time that sticky mess will rise and will become even stickier but that’s OK. You have to preheat your oven to 450 F degrees, and also preheat your cast iron pot as well. 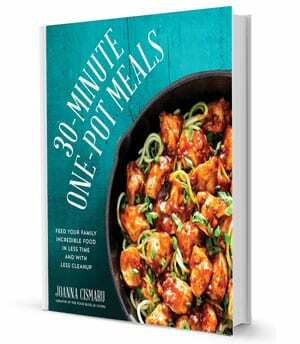 You don’t have to use a cast iron pot if you don’t have one, any other oven proof pot with a lid on would work. When the pot is heated, be careful not to burn yourself, using a lot of flour on your hands roughly shape the dough into a round ball, you don’t have to be perfect, and drop it in the pot. Put the lid on and bake it 30 minutes, after which remove the lid and let it bake for another 15 to 20 minutes until it’s nice and golden brown. Perfection. 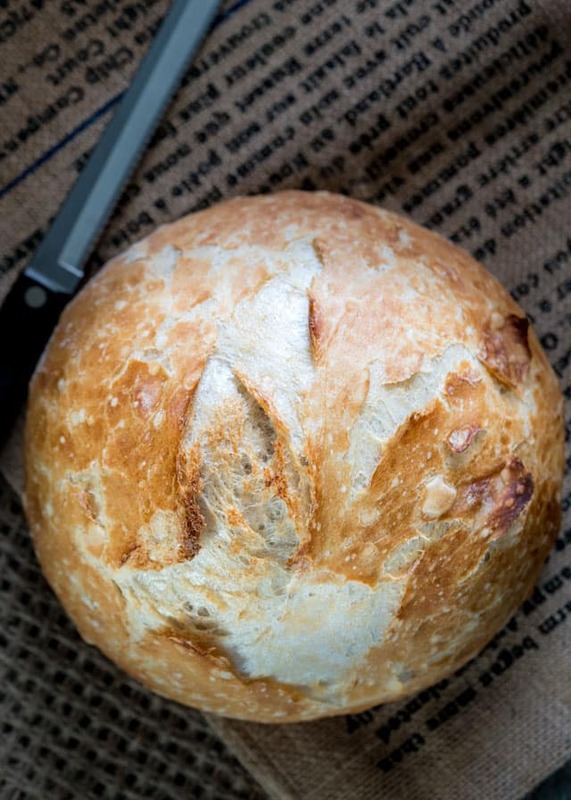 The slow rise at room temperature is what gives no knead bread its power. I’ve been asked many times if it needs to sit around for that long and the answer is simply, yes! The yeast needs time to perform its magic. If your bread turns out too flat, the answer is always look at your yeast. It’s possible the yeast is too old or has expired. Make sure you always use fresh unexpired yeast. Check out the recipe notes for more information on yeast. To prevent your bread from sticking to the pan, make sure you pan is hot enough before adding the dough. If the pan is very hot at the bottom, you bread will instantly begin to cook, letting it rise smoothly. You can double it but you’ll need a bigger pot, such as a 5 or 6 quart Dutch oven. The baking time will also need to be adjusted. You will probably need to bake it for a total of 60 to 70 minutes, the first 30 minutes with the lid on. The bread will be done when the internal temperature is at around 200 F degrees. No Knead Skillet Bread Ready in less than 3 hours, Start to Finish! 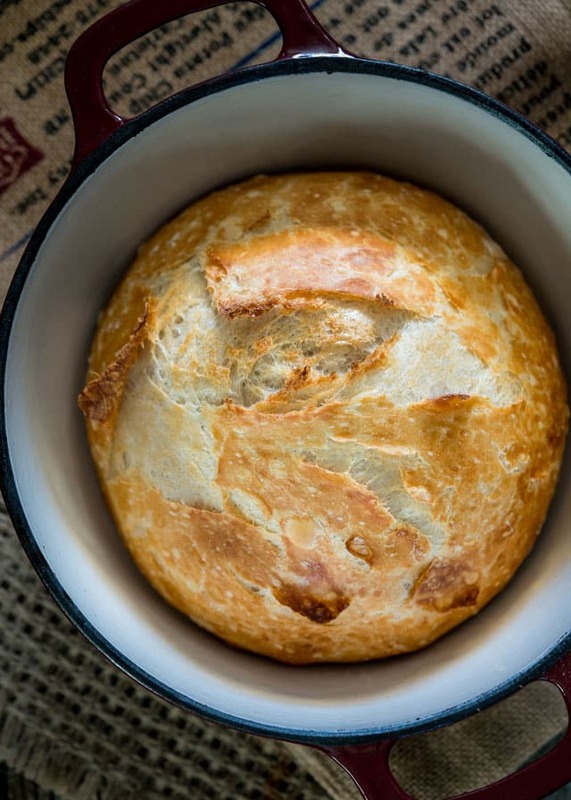 No Knead Bread - no kneading required, 4 simple ingredients, baked in a Dutch Oven! 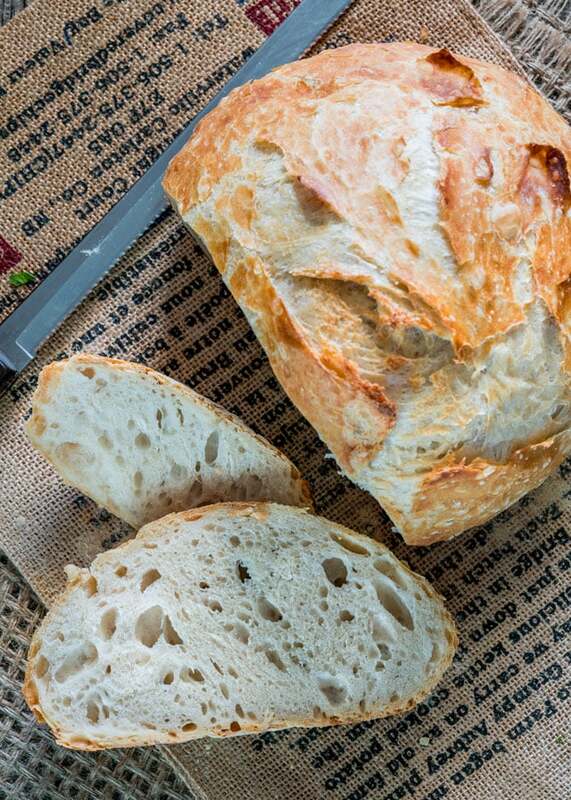 The result is simple perfection, hands down the best bread you'll ever eat! Preheat oven to 450 F degrees. Add your cast iron pot to the oven as it's heating and heat it as well until it's at 450 F degrees. I used a small 3.5 qt Dutch oven. A small Dutch oven is better here so that the bread rises upwards, whereas if you were to use a big Dutch oven the bread would spread out over the entire surface of the pot. If the dough mixture is too dry, add a bit more water, the dough should be sticky, as seen in the video. To add other ingredients to the bread such as dried fruit, seeds, herbs or cheeses, add them in step 1 when mixing everything together. Why is my bread chewy: Usually your bread will be chewy when there isn't enough gluten formation or you're using a low-protein flour. Make sure you let your bread dough rest for at least 12 hours to give it enough time for gluten formation. I don't have a Dutch oven, what can I use instead: If you don't have a Dutch Oven, a covered metal pot would work as well, just make sure it can stand up to 450 F heat. A 4 quart Calphalon soup pot with lid would work as well. If your pot doesn't have a lid, you can cover the pot with heavy-duty aluminum foil, just make sure you seal the pot well. How do I know when my bread is done baking: Tap the bottom! 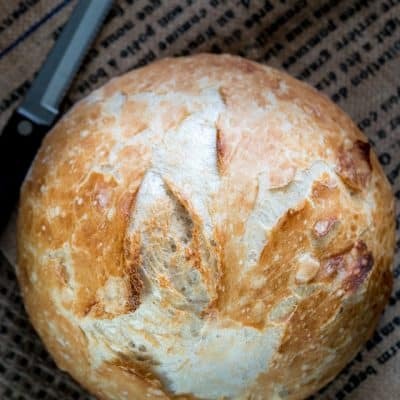 Take the bread out of the Dutch oven, turn it upside down and give the bottom a firm thump with your thumb, or a knock and if it sounds hollow it's done. If using an instant thermometer, the internal temperature should be around 200 F degrees. This recipe was originally shared Nov 10, 2012. Thank you! This bread recipe is amazing. Jo YOU are amazing! Have you tried cutting it in half to make a smaller batch? Does it turn out just as good? If you have a smaller dutch oven, that will definitely work! If you use the same size, it’ll just give you a more flat loaf. Love the idea of rolls!